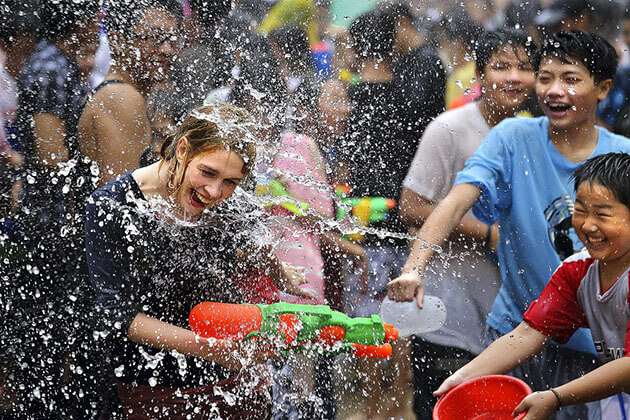 Your Myanmar family tour starts in Yangon, the economic capital of the country. This is the most bustles and hustle city in Myanmar but Yangon still has its own charm with gleaming pagodas, picturesque lakes and vintage vehicles plying its leafy avenues. 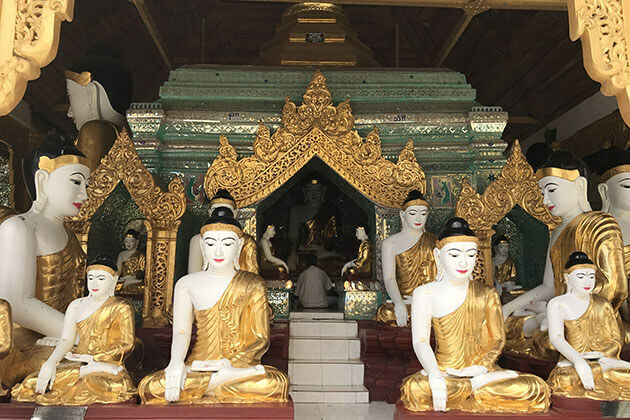 An orientation tour of Yangon’s downtown attractions, local teashops, Kyaukhtatgyi Pagoda’s reclining Buddha statue and the glittering Shwedagon Pagoda which takes on a magical aura at dusk, will definitely leave you in awe. Tour Type: Sightseeing, Culture, Relax, classic. Travel dates: No fixed but the best time is suggested to visit is during October to May. Start/End: Pick up at Yangon airport/ Farewell at Yangon airport. 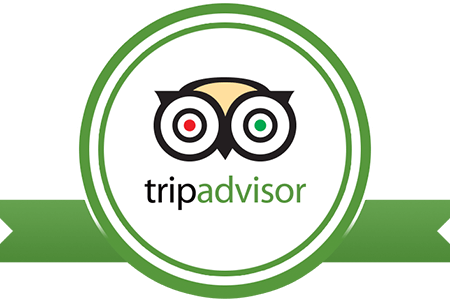 Upon your arrival at Yangon International Airport; welcome by our well-experienced guide. 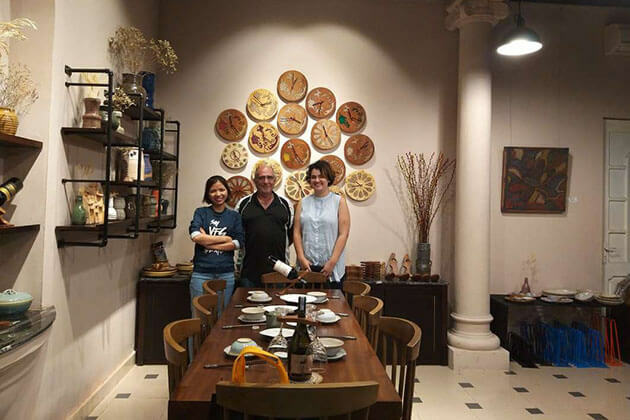 After that, you are with tour guide & driver set off on a Yangon city tour, featuring its most iconic colonial buildings such as National Museum, where you can learn part of the country’s history. 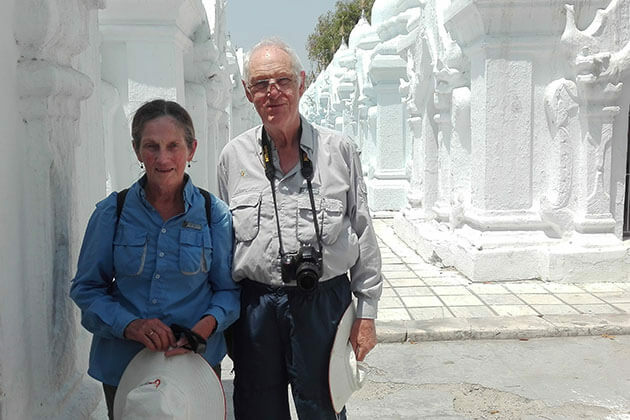 Continue to Chaukhtatgyi Pagoda, home to a 70-meter long reclining Buddha. 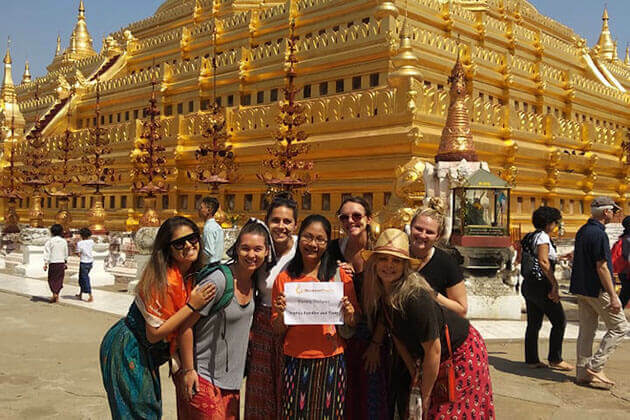 Then pay a visit to the golden Shwedagon Pagoda made up of 60 tons of pure gold leaf. Dinner with a Cultural Show at Karaweik Palace Restaurant. Overnight in Yangon. After breakfast, get ready for a walking tour through downtown Yangon and experience the very daily life of the locals, all the while enjoying delicious authentic street foods. The afternoon time is for a visit to the National Races Village in Thaketa Township. 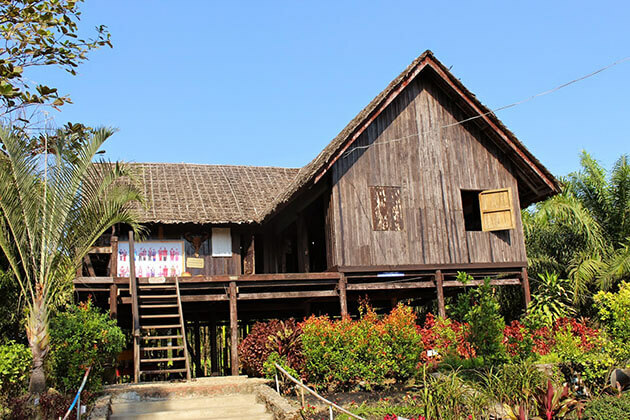 Here you can have a thorough exploration of Myanmar cultures, particularly those of the minorities through the houses, clothes, and activities. There are lots of photo opportunities, so don’t forget to recharge your camera battery! Afterward, head back to Yangon. Overnight in Yangon. After breakfast, board a boat to Twantay, a peaceful town on the bank of the Twantay Canal. The trip takes approximately 2 hours. Take in the beautiful sight of nature and life along the route. Lunch on board. Try the trishaw ride at Twantay, it would be a phenomenal experience! Stop at the local market and Shwesandaw Zedi. 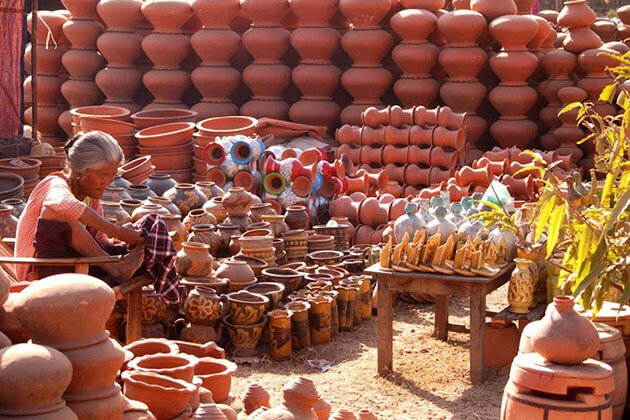 Your final visit is a pottery village, the special product of Twantay. Transfer back to Yangon. Overnight in Yangon. 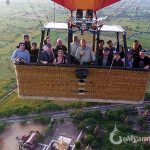 Arrive in Bagan and transfer to the hotel to check in and rest. 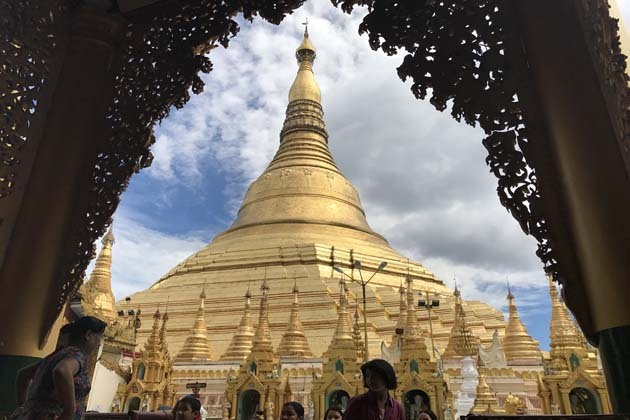 Today’s sightseeing trip begins with a visit to Nyaung Oo Market, followed by the Shwezigon Pagoda, Wetkyi-In Gubyaukgyi cave, and the elegant Htilominlo Temple. 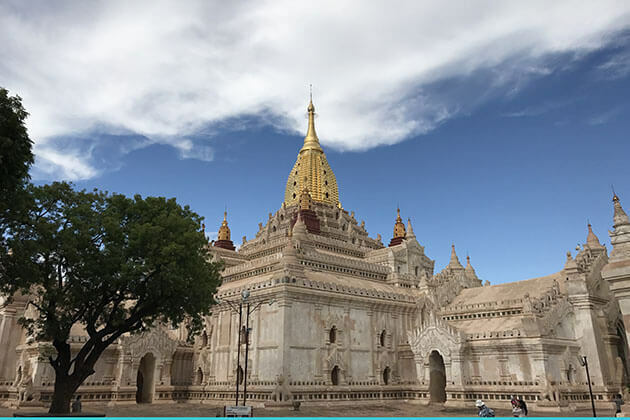 In the afternoon, head to the Ananda Temple, the ancient Ananda Okkyaung monastery, and the highest temple in Bagan, Thatbyinnyu Temple, before embarking on a horse carriage ride, passing dozens of temples, including Sulamani and Dhammayangyi, and the traditional village of Taungbi. Watch the sun paint crimson red over the Bagan plain. Overnight in Bagan. An unforgettable and unique experience! 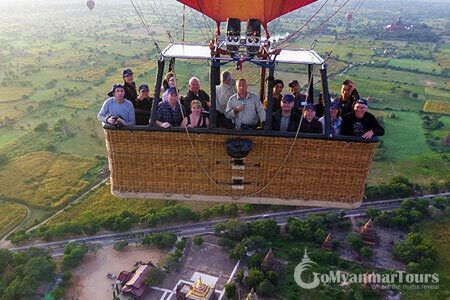 Fly above the 5,000 pagodas of the plain of Bagan while enjoying the sunrise and the fresh morning wind. Note: Balloon trip is subject to weather condition. After breakfast, transfer to Ngat Pyit Taung Monastery and explore the temple’s caves. Then, visit the Monastic Primary School and enjoy playing with the students. 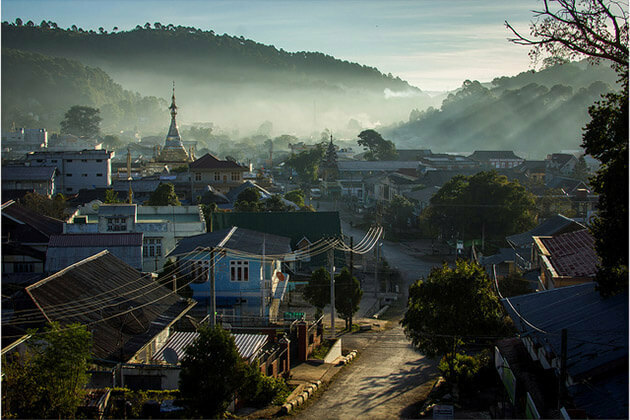 In the afternoon, explore the town of Nyaung U. Learn the interesting process of creating “Poneyay” (pea powder paste) and see how local plum jam is made and packed. Visit handmade lacquer wares and wooden handicrafts shops, and continue to the villages to observe the way traditional bullock carts are made. Don’t hesitate to try making one yourself, as the craftsmen love to share their techniques with visitors. Overnight in Bagan. 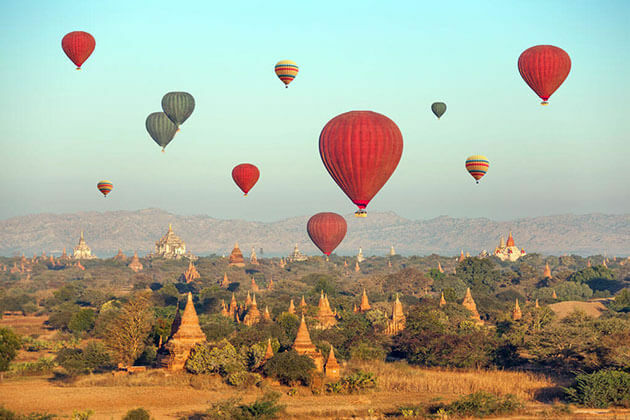 The entire morning is for deeper exploration of Bagan or a rest. After lunch, transfer to the airport for the flight to Heho. 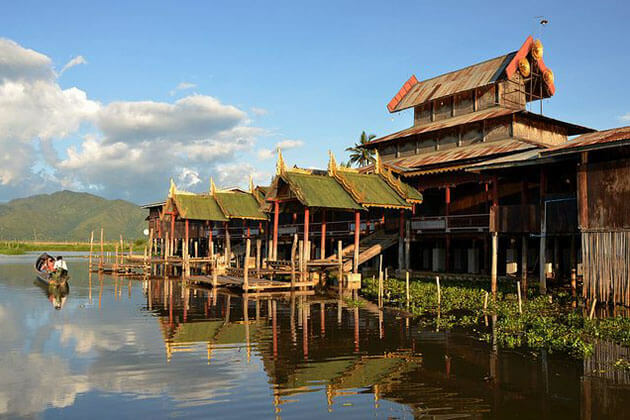 Take a 1-hour scenic drive to Nyaung Shwe, the gateway village to Inle Lake, one of Myanmar’s most spectacular sights. Board on a boat and sail past villages built on stilts over the lake, inhabited by the local Intha people. 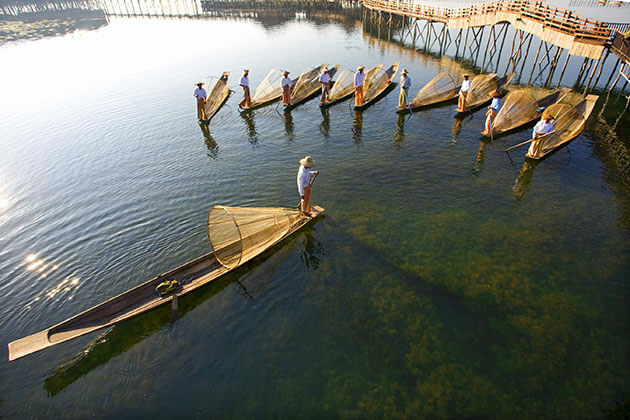 Observe the leg-rowing fishermen and see their floating gardens built up from strips of water hyacinth and mud and anchored to the bottom with bamboo poles. Your hotel is situated upon the lake, with sweeping views of the tranquil waters. The remainder of the afternoon is at your leisure to relax and soak in the views. Overnight in Bagan. 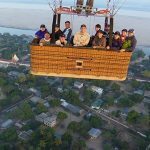 Start with a visit to the Nga Hpe Chaung Monastery, which houses dozens of Shan Buddha Images, and gets even more famous for its unique ‘jumping cats’ who jump through hoops in the air! Continue to Phaung Daw Oo Pagoda, the lake’s main sanctuary. Explore the craft industry of the lake through local workshops. The afternoon is sure to be a memorable experience. Travel by local leg-rowed canoe to an Intha family’s house. Learn the authentic native culinary as you prepare dinner yourself with the help from the family. 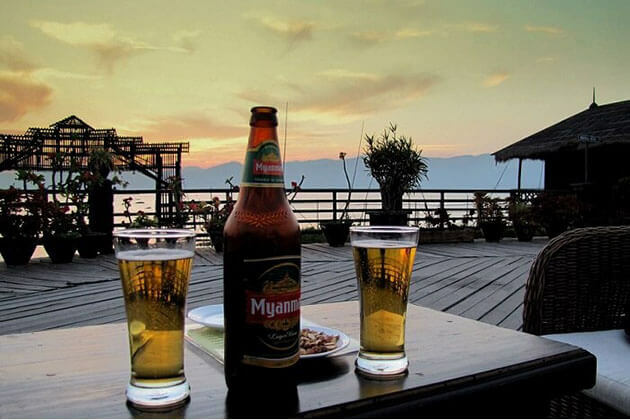 Overnight on Inle Lake. The morning is for your own use. 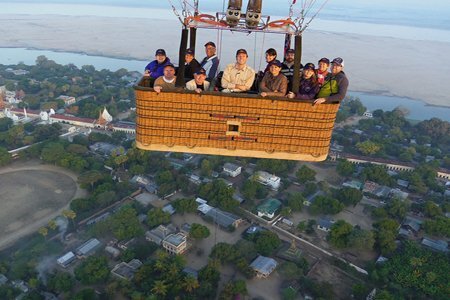 Flight back to Yangon in the afternoon and enjoy some sightseeing there. Overnight in Yangon. Breakfast at the hotel. 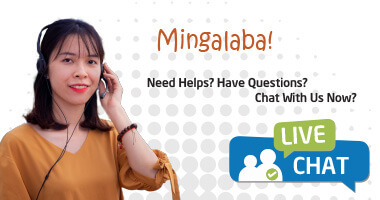 Leisure on your own time and wait till you are picked-up at hotel & transferred to the airport for your onward international flight to another country or back home. Trip ends.